Outstanding quality, sign me up! "It's striking that, late in his career, the Italian architect Renzo Piano should choose to raid the paintbox. 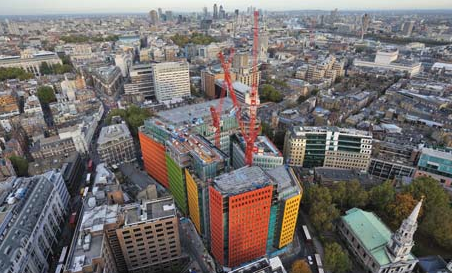 Nothing in his oeuvre prepares you for Central Saint Giles, where multistorey planes of orange, lemon and lime appear the middle of London... which passers-by either hate or love." I'm sure you have noticed these are not my photographs. Unless I've recently acquired a helicopter to hang from, which would be grand but I haven't. I was just struck by these images and found myself sending far too much time reading about the controversial design of The Central Saint Giles and its designer. I do confess to being a bit of an architectural nerd and find all of it quite fascinating. I applaud Renzo. This must have been quite a design risk after spending decades furthering his own signature style or what the public perceived his style to be (natural in color and material). I still am not sure if I "love or hate" this pop of color on London's skyline. Either way, I can appreciate the risk and thrill this must have held for Piano. I have found that with, "beautiful precision and assembled with a certain complexity..." there is great and unmatchable value. "powerful though the colours are, there's judgment in their precise tones." Perhaps there is something more to outstanding quality no matter what form it comes in. Me thinks so.